Daruma (dharma) doll is a round Japanese doll. It represents the Indian monk Bodhidharma. He was the founder of Zen Buddhism. This doll was primarily made as a toy (“omocha”), but in real life of many Japanese people daruma is a good luck charm and symbol of someone who never gives up. It is believed that the Daruma doll originated from the Daruma-dera (Temple of Daruma) in the city of Takasaki, Gunma Prefecture. This city, located north of Tokyo, also has its Daruma Doll Festival (“daruma-ichi”). Many visitors use the occasion to buy their new Daruma dolls. Crickets are nocturnal insects of the Gryllidae family. According to experts there about 900 species of crickets. Most people know them because of the sound male crickets create. In English language this is known as chirping. In science term stridulation is used. Crickets chirp is to attract female crickets, when another male cricket is discovered and immediately after mating. Pigs have been with us for thousands of years. In many civilisations they were or still are much more than source of food. Nordic god Frey had a golden boar known as the "Gold-Bristle" or "Gold-Mane". Pigs are one of twelve animals in the Chinese zodiac. 2019 is going to be the next year of pig. The Chinese believe that the pig symbolizes tolerance, honesty and initiative. In the Bible there is a famous sentence "Do not cast your pearls before swine" which tells us that it is wrong to share something valuable with those who do not appreciate its value. Chan Chu (Ch'an Chu) or "Three-legged Money Frog" is a popular Chinese symbol of prosperity. According to Feng Shui this frog wards off evil spirits and it can help you in the rise of your income. In the Chinese mythology it is the companion of the 10th century Taoist alchemist Liu-Hai. There is an ancient story claiming that this frog is actually a woman who was transformed into a frog as her husband stole the elixir of immortality. It is believed that this special frog personifies the Moon. Its three legs are thought to be three Moon phases. 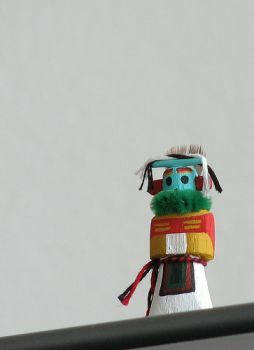 Hopi Kachina (Katsina) dolls are made from the roots of cottonwood trees. These dolls actually represent masked spirits of the Hopi nation called “kachina”. The kachina are spirits of Hopi deities, the deceased ancestors, animals and different natural elements. The Hopi mainly live in the northeast of Arizona, USA. According to their ancient beliefs most of kachina exist in on the Humphreys Peak (elevation of 3,852 metres) located some 17.7 kilometres north of Flagstaff, Arizona. Teru teru bozu is a traditional Japanese doll made of white cloth or paper. Japanese verb “teru” describes sunshine. “Bozu" has several different meanings. It may mean a Buddhist monk, a bold person or a little boy. These dolls are hung on wire outside house window. 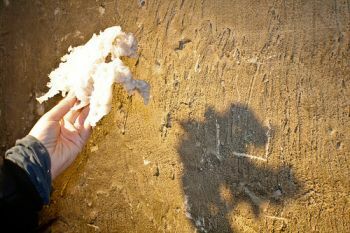 People believe that they can ensure good weather. Teru teru bozu dolls first became popular in the cities of Edo (Tokugawa) period (1603-1868). Today they are especially popular among school children who often make them in hope of good weather during their school trips. Cats have been part of human communities for over 9,500 years. In many civilisations they have been more than ordinary pets. A creation myth or creation story describes beliefs how the world people live in was created and how people came to this world. Creation myths differ from culture to culture. They are transferred from generation to generation. 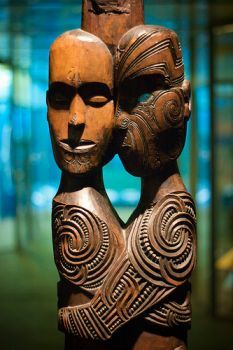 Maori people are the natives of New Zealand. Their creation myth tells a story of Rangi and Papa. 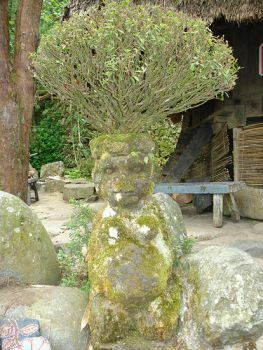 Hair has been part of beliefs in many civilisations throughout the World. They are often about the length or colour of the hair. Nuno sa Punso (duwende) or simply Nuno is a dwarf from the Philippine mythology. He is so small. Some say you would need something like a microscope to actually see him. There are also those who believe that he looks like an old man. Ladybug (Lady Beetle or Ladybird Beetle) is one of the most popular bugs. There are about 5,000 ladybug species in the world. Many of them have spots on them. 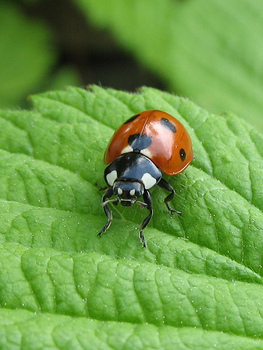 The most popular ladybug is the one with black spots. Ladybug can have up to 20 spots on her body. 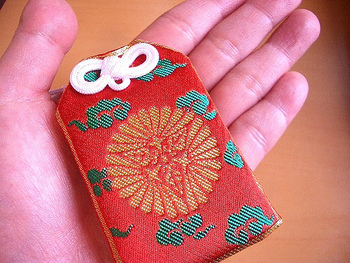 Omamori (in Japanese o-mamori means honourable protector) is a traditional Japanese charm dedicated to some Shinto Kami (gods, angels, spirits) or Buddhist figure. Omomori is usually made of cloth. People keep omamori together with a piece of wood or paper with prayers written on it. Witches (in Catalan "bruixes") have quite an important place in Catalan folklore. According to local beliefs a witch is a woman who made an agreement with the devil. She has supernatural powers which she can use for her own purpose or just out of pure evil. Among numerous powers, witches can also see people naked through their clothes. Well, maybe they should be part of security at airports. Güije is a strange character existing in numerous Cuban legends. There are people saying that they saw him. But, nobody is really sure about his appearance. Andrzejki is the time when single young women in Poland try to predict their luck in love and whom they are going to marry. These kind of little fortune telling games are played on the 30th of November which is the Saint Andrew's Day. Nazar is an amulet that protects from the evil eye. Evil eye is a special look or the power to cause bad luck or even injury on some person. Nazar is popular in countries like for example Turkey, Greece, Iran or Armenia. You can see it in homes, offices, as jewelry, decoration on mobile phone etc. 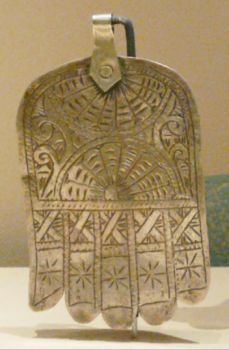 Hamsa (Chamsa, Khamsa) or Hamesh hand is a palm-shaped protective amulet. It is used by Muslims and Jews. The word “hamsa” has the Semitic root which means “five”. Muslim people traditionally call it the Hand of Fatima. Fatima Zahra was the daughter of the Prophet Mohammed. Hamsa is one of the national symbols of Algeria. Maneki Neko (in Japanese Beckoning Cat) is a traditional Japanese cat sculpture who suppose to bring good luck to the person who owns it. 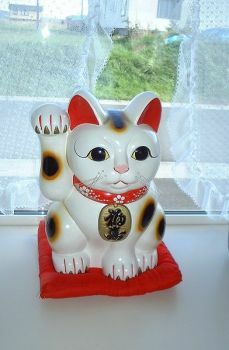 It is also known as Lucky Cat, Fortune Cat or Welcoming Cat. The cat breed depicted in this sculpture is usually the Japanese Bobtail. Maneki Neko is traditionally put at the entrance of a shop, restaurant etc. Maneki Neko sculpture is usually made of ceramic. There are more expensive examples made of jade or even gold. 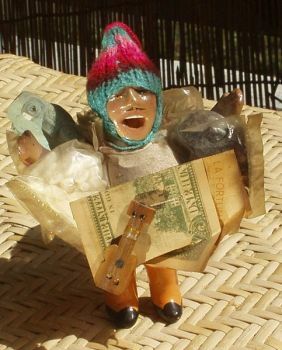 Ekeko (Equeco) is the God of abundance and prosperous life of the people living in the Andean Altiplano (high plateau) region of South America. In Aymará language word “ekeko” means a dwarf. He is depicted as the man with moustache. He wears traditional clothes. He carries several bags and baskets full of food, banknotes and some other objects needed for everyday life. Tanuki is the Japanese word used to name the Japanese raccoon dog (Nyctereutes procyonoides viverrinus). Tanuki is an important character in Japanese folk beliefs and art. You can see Tanuki statues in front of many temples or restaurants. Horseshoe is an u-shaped object that is glued or nailed to the hooves of horses and some draught animals. They are made of steel, aluminium, magnesium, titanium, plastic or rubber. They are set by people known as farriers or blacksmiths. The purpose of a horseshoe is mainly a protective one. Ankou is a creature representing death in the Breton mythology. He is also called the “king of dead.” There many different descriptions of the Ankou's appearance. 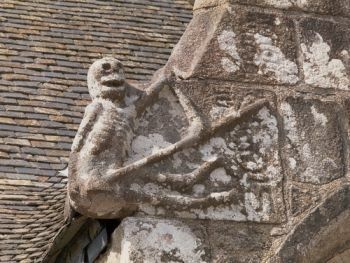 Some local tales describe Ankou as a man or skeleton holding a scythe. There are also tales with him as a man-like shadow wearing an old hat with a scythe in his hand. He sits on a cart into which he puts dead people. The cart is often pulled by two horses. One of these horses is old and very thin. The one is young and full of strength. There are also descriptions where the cart is pulled by four horses. Some beliefs mention him as the first child of Adam and Eve. In certain tales Ankou is the first person who dies in certain year. This person collects dead people before going to the afterlife. Xiezhi or haetae is a famous Chinese mythological animal which is believed to be able to distinguish between good and evil. It symbolizes justice. It is kind of an unicorn shaped as a lion. It has a short tail and dragon skin. It usually has horns. It can be seen all over China. 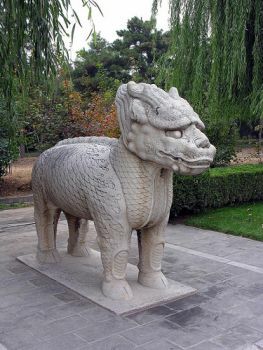 For example, there are 4 Xiezhi statues in the Holy Way of the Ming Tombs of Beijing. People in all countries have their own daily rituals and beliefs. Russia is no exception. Let's assume that you are preparing for a journey. You packed your things. Russians believe that if you want to return to a place of your departure you should sit on your luggage for few moments.